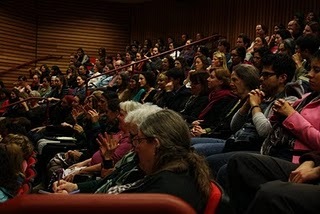 Last Wednesday, over 200 people packed the theater and an overflow room at the Brower Center for WEA’s final Weaving the Worlds event of 2010! We are so grateful that so many of our community gathered to support our work in North America. Check out our Facebook page for beautiful photographs of the event. Our Collaborations for the Sacred Earth event began with a Solutions Salon, with indigenous environmental organizations from Northern California sharing their stories and work with our event attendees. Joining us were the International Indian Treaty Council, Black Mesa Indigenous Support, the Winnemem Wintu tribe, 1,000 Hummingbirds, Seventh Native American Generations Youth Magazine, Intertribal Friendship House, Rooted In Community, American Indian Contemporary Arts, Land is Life, Sacred Land Film Project, Native Bay Circle KPFA Radio, Shellmound Walk, and Cultural Conservancy. Musicians Cy Wagoner, Natural Man, George Galvis, and T-Hawk blessed the evening with powerful flute, drumming and song. WEA artistic lead Nikila Badua opened the evening with a grounding song, with WEA Co-Director Amira Diamond on violin. 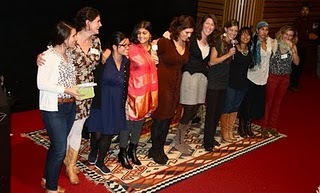 Co-Directors Melinda Kramer and Amira Diamond told stories from our work in Africa and India. After sharing our moving video from the May 2010 Advocacy Delegation, Defending Sacred Places in the Southwest, North America Director Caitlin Sislin provided an in-depth look at the work of our Advocacy Network in promoting energy justice, sacred places protection, and environmental health in collaboration with indigenous women environmental leaders. 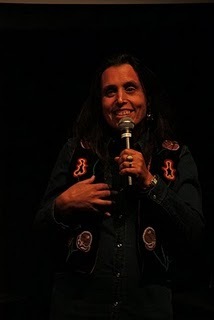 In her keynote address, Winona LaDuke of Honor the Earth invited us to cultivate a shared sense of moral outrage and of hope - and named the crucial role of friends and allies in the movement for environmental justice and sustainability. We are honored to stand in alliance with Honor the Earth and our other project partners throughout North America. Come join us once again on Sunday, November 21st, 2010 at 8:30 P.M. for a celebration of the harvest at Gather Restaurant. Enjoy music, delicious organic seasonal fare, and one another. 100% of your purchases will be donated to WEA! Email events@womensearthalliance.org for more information. Thank you for joining us. Each time we gather, the world changes.